Past Projects, Photos, Videos, Etc. 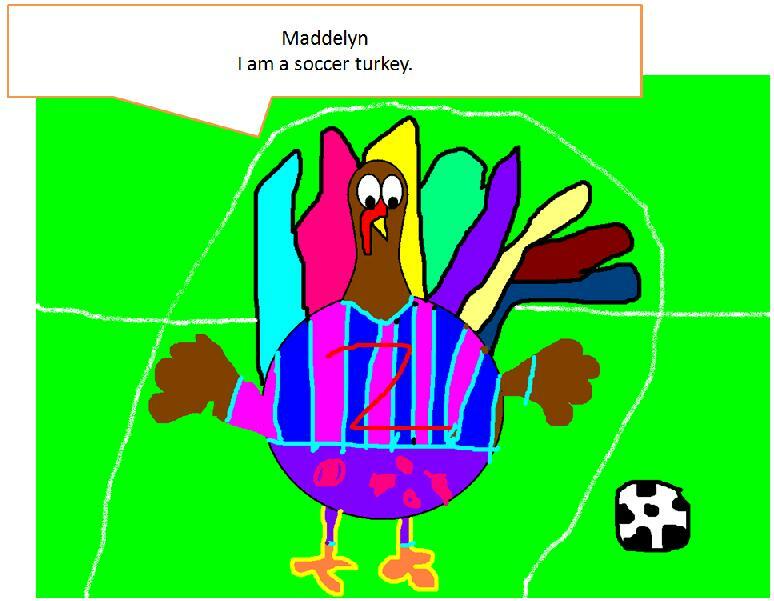 Click here to view third grade (2010) Turkeys With Dressing PowerPoint from Syring, Dieck, and Elms!! You may need to download the FREE POWERPOINT VIEWER. Click here to go to the free download. Click the links to view projects! By: Third Grade Reading Group! First graders made an informational movie called, "The Magic School Bus Explores Insects!" Kindergarten movie titled, "Let's Go Exploring." 4th & 5th graders learned how to create webpages with Google Sites! Elms Road Elementary kindergarten students listened to the book "Chicka Chicka Boom Boom." They used the program Paint to draw the coconut tree! Click here to watch a slide show displaying their work!! Elms first graders used the program Paint to draw "Ten Apples Up on Top." Check out their pictures!! First grade movie titled, "The Magic School Bus Explores Space!" Second grade students use writing and reading skills in the computer lab. They designed an egg in Paint. Then they wrote a descriptive paragraph about their egg. 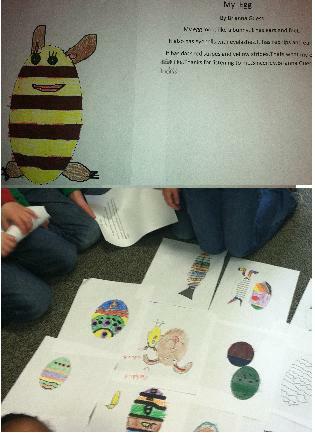 As they read their paragraph, other students try to guess which egg they are describing! Syring Elementary kindergarten students listened to the book "Chicka Chicka Boom Boom." They used the program Paint to draw the coconut tree! Click here to watch a slide show displaying their work!! Syring first graders used the program Paint to draw "Ten Apples Up on Top." 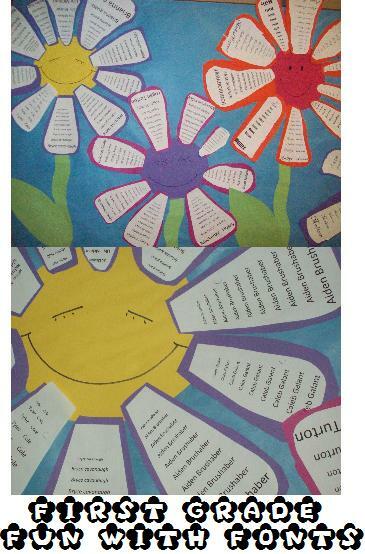 Click here to see Vokis created by 4th Graders telling what they are thankful for this year. Kindergarten students followed the snowman glyph to create snowmen. They graphed the results! Click here to watch the Elms kindergarten slideshow!! Kindergarteners made a video of the ABCs of Christmas. First grade made holiday art videos. Second graders created holiday greetings from around the world. Third grade students each created their own videos of the Gingerbreadman. They created gingerbread pictures using an online application. The movie was made with Windows Movie Maker. Students also used Audacity, which is a recording studio program, to record the audio. Fourth grade made a video titled, "Christmas All Over The World!" Students learned photo editing, and how to use Windows Movie Maker. Fifth grade "Elfed Out" their photos as they learned photo editing skills. They also used Audacity to record themselves singing and changed the pitch so the song sounds like elves are singing it. 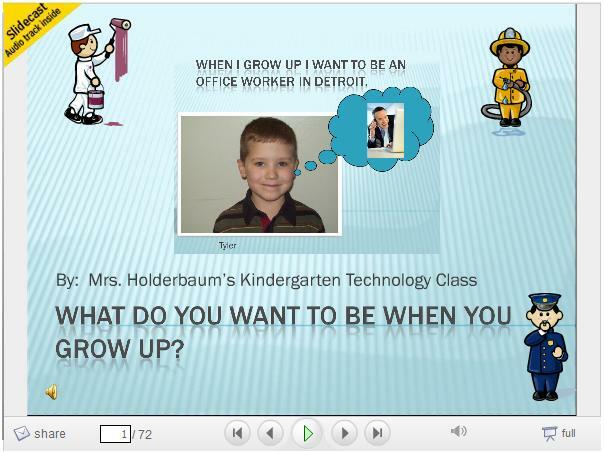 All students created a movie using Windows Movie Maker. Elms third, fourth, and fifth graders created animated characters called Vokis and gave them a voice. Check out their Thanksgiving webpage that displays their Vokis. Elms Road kindergarten students listened to the book "Chicka Chicka Boom Boom." They used the program Paint to draw the coconut tree! Click here to watch a slide show displaying their work!! Elms Road first graders used the program Paint to draw "Ten Apples Up on Top." Check out their pictures!! 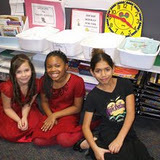 Second grade created innovative holiday poetry to the tuneRow Row Row Your Boat, and made illustrations. Syring third, fourth, and fifth graders created animated characters called Vokis and gave them a voice. Check out their Thanksgiving webpage that displays their Vokis. Syring first graders used the program Paint to draw "Ten Apples Up on Top." Check out their pictures!! Dieck third, fourth, and fifth graders created animated characters called Vokis and gave them a voice. Check out their Thanksgiving webpage that displays their Vokis. View beginning of the year intro movie, introducing students! Listen to our podcast: The Cat in the Hat Visits Third Grade!! Click here to watch a Multiplication movie made by our third grade class using the "green screen!" Click above picture to view pictures from performance night! Click here to view pictures from our bowling Superkid and Halloween! Click Here To View Student Created Webpages!!!! Check out the link to their digital multiplication flash cards on thier webpages!! View the Elms Veteran's Day Slideshow! ~Check out our Michigan videos! Students reported on a landmark or destination in MI, and then created a video using the "greenscreen!" Click the link below to view. Watch a slideshow of our third graders reading during, "March is Reading Month!" Read the newspaper article about our trip to Dolgeville, NY! View pictures of our students with animals from Science Alive!!!! Click here to view pictures from our third grade play, "I Need a Little Christmas Vacation."